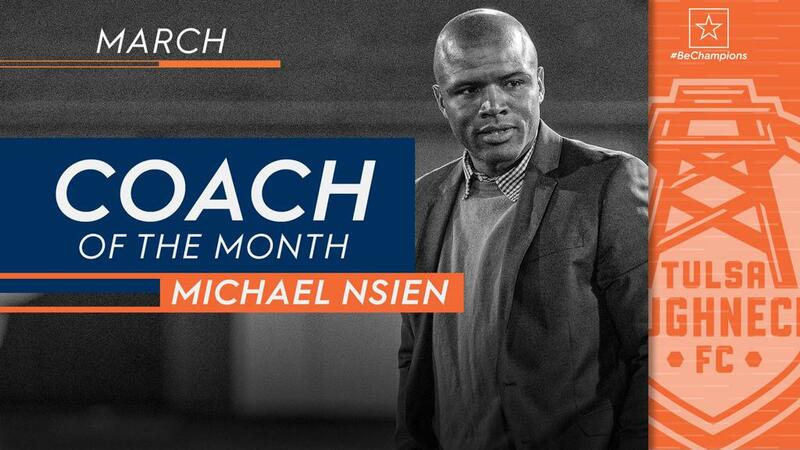 TAMPA, Fla. – Tulsa Roughnecks FC’s Michael Nsien has been voted the USL Championship’s Coach of the Month for March after leading the side to the top of the Western Conference standings in the opening month of the 2019 season. Appointed as the club’s permanent Head Coach this offseason after previously serving as interim manager in 2018, Nsien helped oversee an overhaul of the Roughnecks’ roster that has paid big dividends so far this season. The Roughnecks equaled their win total from the 2018 season as they went 3-1-1 in March, with new arrival Luca Lobo ending the month tied for the league-lead with five goals. Nsien received 56 percent of the poll to claim the award ahead of New Mexico United’s Troy Lesesne, who received 16 percent of the poll as he led the expansion side to an undefeated opening month of the season with a 2-0-3 record. The USL Championship’s Coach of the Month award is voted upon by the USL Championship National Media Panel and the USL Championship Technical Committee, with each group responsible for 50 percent of the overall vote.